Last Friday I baked Paula Deen’s Chocolate Gooey Butter Cookies to my heart’s content and wrote a little post. The following morning I awoke to a LOT of love from people who enjoyed reading about those little bitefuls of delicious chocolaty gooeyness. And the love continued throughout a particularly stressful day, and I was so very grateful that my baking which makes me happy was making others happy as well. 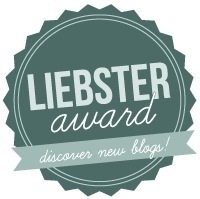 About midway through the day I saw a notification that my little blog had been nominated by to receive a Liebster Award! I was so very excited! “Someone is a fan and nominated me, hooray,” I thought to myself. So I must say hello to Alice at Pud Bakes and graciously thank her for reading my blog and nominating it for a Liebster, and for completely making my day! Alice likes to bake, as do I, and you should definitely go and check out her blog. What is the Liebster Award? I asked myself the same thing, and once I read about it I have to say it’s a really great idea. As Alice explained, “The Liebster Award is given to those blog writers with fewer than 200 blog followers by people who enjoy reading their posts and want to help share each others’ work. ” What a nice way to acknowledge blogs you like to read and share them with others! 1. I eat peanut butter very often, in fact almost daily, and I have since I was about 6 years old. 2. I’m a leap year baby (and I take birthdays very seriously). 3. Peonies are my favorite flower and I have a tattoo of one that covers almost the entire top of one of my feet. (Roses are a second fav, no rose tattoos yet). 4. I really like to workout and I’m usually hiking, walking, weight lifting, or taking zumba class. 5. We have two dogs, a rescue mutt and an Irish Wolfhound. 6. I love NYC and worked there for over 5 years. 7. I become addicted to foods and meals and cook/order/eat them regularly. 8. I’m always worried I’m not dressed stylishly enough and if I ever win the lotto I plan to hire a personal stylist. 9. I am in the early stages of writing two novels. 10. I am a night owl and I am usually up until at least midnight each night (and I am definitely not a morning person). Why and where do you normally blog? Why? I blog because I love food and I love to write, so I recently began my blog to put these two things together which make me happy, and I am having so much fun blogging! Where? I am writing constantly. I almost always have a blog post in the works and a large working draft folder. Sometimes I am blogging from my laptop at home, and most of the times I’m blogging from my iphone wherever I am. I usually take photos of food, keep notes of food blogging ideas, and use my wordpress app on my iphone. If you had to choose to never eat meat or vegetables ever again, which would you choose and why? Vegetables. I am a “meat and potatoes” kind of girl, or rather a “meat and [insert any type of carb here]” kind of girl. It took me a good part of my adolescence to start eating vegetables, and I really eat them now so that I am eating healthy. However, my three favorite “go to” vegetables that I would reluctantly give up are spinach, artichokes, and carrots. What is the most ridiculous child’s name you have heard in recent years? As a teacher, I’ve seen some very unique names over the years. I think the most ridiculous I’ve seen was about 2-3 years ago was a student whose first name was actually Princess. Chocolate cake, fruit cake or vanilla cake? Do you normally follow a recipe? Or do you always think you know better?! I usually follow recipes very closely, especially when I’m cooking because at this point I’m learning how to cook. Sometimes when I bake I will make little changes after making the recipe a few times when I feel I’ve “mastered” it. What is you favourite TV series? I really like TV and films, but right now the TV show I watch most regularly is Big Bang Theory, followed by Downton Abbey, Girls, and Game of Thrones…I can keep going, but that enough for now. What was you favourite childhood book? This question is probably the hardest for me to answer. I am a literature teacher and I have always loved to read since I was a very little girl. In other words, I am constantly reading and I have always been this way. If I am not watching a film or tv show, I am reading. In fact, I usually read while I’m baking! So I think I should answer this by saying the earliest book I remember reading over and over again as a child, or my first favorite book, is Where the Wild Things Are. Are there any tips you would give to new bloggers? I still consider myself a new blogger, I’ve only been doing this for about two months. However, for those just starting out I’d say be true to who you are. If you are passionate about what you’re blogging about it will come out in your posts and people will see that and become regular readers. It can be easy to get caught up in the moment of trying to post as much as someone else you might admire or who you’re trying to emulate, especially those who have been blogging for a while and have a large following. I believe looking to other bloggers for inspiration is an excellent idea, just make sure your blog is your own and about what you want to write about. Don’t forget to enjoy what you’re doing. I find blogging fun and I look forward to doing it. If you could visit anywhere in the world, where would it be and why? I desperately want to visit England. British literature is my favorite and what I’m usually reading. So I’m basically obsessed with all things British (including British accents, the royal family, and David Beckham – he’s one of my favorite celebrities). What encouraged you to start blogging? I love to write and I love to eat (and bake). Since finishing graduate school I’ve decided I want to be a writer (and teacher) and blogging seemed a logical place to begin. It took me a few months to figure out food blogging was my niche. I recently started watching the Cooking Channel over this past Christmas break, and combined with my usual holiday baking and a few friends who asked for recommendations where to eat, which happens regularly, I sort of had an “a ha” moment one day. I bounced the idea off of my husband and a few close friends and they were all so very supportive. So I spent most of the month of January setting up my blog (I’m not very tech savvy) and writing posts so I had a few drafts in the works. I also bounced a few ideas off of one of my good friends who is a successful blogger (not a food blogger) and whose posts I read regularly. My hardest decision was when to launch the blog, I kept thinking it wasn’t “ready.” My first local food event I blogged about was a chowder festival that my husband and I decided to attend when a friend invited us along. A day or two before the festival I decided that it was time to launch and the festival was a perfect place to begin. I posted an entry about something I had baked a few days before this way my blog had something else on it, and then I decided to give it a go and my blog was born. The food blogging community is extremely supportive and welcoming group of people and with the help of social media my little blog is growing quite nicely. What is your absolute guilty pleasure!? Shoes, books, and sweets. It’s really a tie between all three. Somedays I would choose one over the other two, but it depends on the day. All my loved ones would be able to answer this question if you asked them what makes Kim happy. Sometimes my friends like to tease me and ask which of the three I could give up, and I don’t think I could give any of them up. I believe shoes are the most important part of an outfit (I do adore handbags as well, I guess they’d come fourth on my list) and they are FUN. I have always been a reader and books enable us to learn, grow, and exercise our imaginations. Sweets, well sweets make everyone smile. And when you have a sweet tooth like I do, which I am sure is obvious when you read my blog, you can’t live without them. 1. How much time do you spend each week blogging? 2. Do you use social media as a blogging tool? 3. If you could travel anywhere in the world, where would you like to go? 4. Who is your favorite person of all time (actual person or fictional character)? 5. Who or what inspires you? 6. How did you begin blogging? 7. What blogging challenges have you faced? 8. What is your favorite savory food? 9. What is your favorite sweet food? 10. What is your favorite book of all time? 11. What is your favorite movie of all time? Two Fairfield County Food Firsts This Weekend! By the way, thanks a million!! Thank you! The theme is a free theme from WordPress. Hi there, just became aware of your blog through Google, and found that it is really informative. I gonna watch out for brussels. I be grateful if you continue this in future. Lots of people will be benefited from your writing. Cheers!